I’ve recently finished this La Cabronita style build, using yet another body from GuitarBuild.co.uk. It’s pretty much Fender specification, down to the USA Standard Stratocaster hardtail bridge, pearl button tuners and of course, TV Jones Powertron pickups. Rather than the S1 switch, I have used a normal push-push pot to bring in a tone circuit which just tames the high frequencies a bit. I’ll need to dismantle this guitar at some point and refinish it. When I applied the clearcoat I accidentally used a spraygun which had some metal flake residue in it which gave the guitar body a bit of sparkle. I was impatient to assemble the guitar and try it out so it is currently a bit glittery. I have now repainted my guitar and am really enjoying playing it. It’s my favourite guitar at the moment and the TV Jones pickups sound wonderful. Hi I’ve just bought some Cab bodies from Guitarbuild and they directed me to you when I wanted to know what size bridge to use on mine. I’m in Australia and almost everything I need I have to ship from overseas* so it’s a pain when I order the wrong thing. 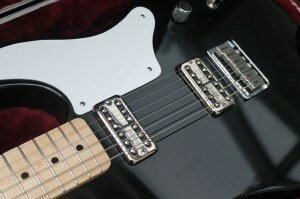 From looking at pics online the Fender MIM hardtail strat bridge seems right – is the one you used? *although it usually cheaper to do so – the tyranny of distance. Hi Dan, I used the USA Standard hardtail as it is the one used on the Custom Shop La Cabronita and I think it has slightly better quality saddles. The USA one does have the “narrow” string spacing so I’m pretty sure that the Mexican version would work fine. Hi Steve, really nice build! I love that black body with maple fingerboard look, reminds me of Gilmour every time! I’m building a La Cab myself at the moment, using your excellent nitrocellulose lacquer on a body from GuitarBuild.co.uk. I’ll let you know how I get on. My neck arrived from Warmoth today. Rosewood/Pau Ferro: it’s gorgeous! Thanks Mark. I have now refinished and reassembled my Cab and although black could be thought a bit of a safe option I think it looks classy. It’s currently my favourite guitar. I used a couple of 0.0047μF capacitors on the tone switch and it gives a really nice “cocked wah” honk when engaged. I hope your build goes well – I look forward to hearing how it goes, and if you have any questions, just ask! Hi Steve, very nice guitar! How did you ground the bridge plate? Thank you, it’s my favourite at the moment! To earth the strings, I drilled a hole from under the bridge plate to the pickup rout and ran a wire through there to the control cavity. It’s much easier that way than going direct into the control cavity, but that’s an option. I’m considering a cabronita build using a body from guitarbuild.co.uk. This will be my first build and although I’m happy with the generally assembly and painting of the guitar, I haven’t the first idea when it comes to the electrics. Could you share your wiring diagram? Or maybe even put together a wiring kit that I could purchase from you and drop straight in? For cost reasons I think I’ll be using the artec filtertron copies. Any help is greatly appreciated! Hi Jim, sorry for the delay replying but your comment ended up as spam for some reason. The La Cabronita wiring diagram is pretty simple and this guy http://axecaster.co.uk/blog/?p=503 has redrawn it for use with a standard switched pot. The circuit I used however is even simpler. I have two .002μF capacitors twisted together which when engaged, act on each or both pickups. Hi Steve, how much would a loom cost for the two pickup cabronita please? I’ve got the sonic blue paint and lacquer from your self, I’m waiting for warmer weather before I start painting. Getting close to doin the build but tis there a trick to getting the pickups into the holes? I bought the Fender ‘Fidelitron’ pickups as they were cheaper than a set of TVJones but they slightly flared egdes on the bottom of the covers and need a mm or two to fit. Would it be a good idea to grind that edge down – I don’t think it’ll damage the sound. A bit late now I know but it’s always best to do a test fit of parts before painting. My TV Jones pickups were a bit tight in the holes but I opened the holes up ever so slightly with a Dremel, just to remove the overspray really. It’s better to remove wood rather than metal but some careful filing of the pickup bottoms probably won’t harm. Measure carefully first to see how much needs taking off. Just a thought though – you do need to drop the pickups in vertically, any deviation from this will cause them to snag on the sides of the rout. Just bought a Cabronita body from Phil and was about to buy a bridge and ferrules when I noticed the fixing holes on the bridge are at 21mm apart. Can you tell me what bridge you used from where? Every modern hardtail I look at has 23mm spacing. Phil pointed me in your direction. Also which ferrules. The holes are about 18mm deep meaning I would have to use collared ones? Hi Neil, sorry for the delay replying but your comment ended up as spam for some reason. I used the Fender USA Standard Stratocaster bridge (part number 005-8420-000) the same as the original Fender La Cabronita. I used some special ferrules which were given to me by a friend. A friend of his turned from titanium rod on his lathe. Phil at Guitarbuild made my body especially for these ferrules, but I don’t know what he does with the production bodies. Hi Steve, sorry to resurrect such an old thread, I cannot seem to find 005-8420-000 anywhere (52mm string spacing?). If you can share where you sourced the part it would be tremendously useful. I think that it’s been discontinued by Fender as they now fit a different bridge to the hardtail Strat. I have thanks Jacques and hope you have too. I have a white one I made here, the same as the one I used if that’s any good? Hi Steve – I love the look of your Cabronita project. I’d like something very similar to yours but don’t have the know how (or time!) so wondered whether you’d take on the project. I appreciate how busy you are and realise that a build is a time consuming job but would obviously be flexible regarding timescales. 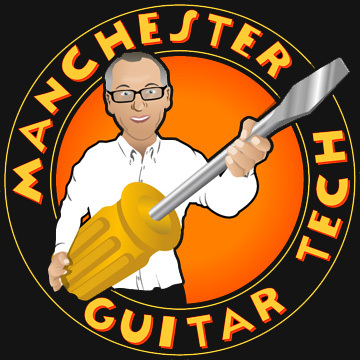 Yes of course, please email me https://www.manchesterguitartech.co.uk/contact-me/ and we can discuss details/specs. Loving the La Cabronita build. Looks pretty sweet. I am in the process of building my own La Cabronita. Got a walnut body from Guitarbuild via ebay and a flamed maple neck. Hardware will eventually be all chrome. However, electrics are not my thing and I was wondering if I could get hold of some from of wiring loom that can just be dropped in? If i can avoid any soldering that would be a bonus. Hi Steve, could you please tell me if anyone in UK or even Europe does Cab pickguards (2pickup version) stock? Hi Dave, I don’t know of anyone sorry. WD Music in the USA offer them http://www.wdmusic.com/pickguard_tec_4.html so it might be worth contactin the UK distributor http://www.wdmusic.co.uk/ to see if they can source you one. I have a template that I used for the Guitarbuild body but it isn’t exactly the same as a Fender. Ok great. Thanks for your help. Just embarking on mt first build using a Guitarbuild Cabronita body. I’m pn a budget and was wondering what guitar necks you think I should consider. I was seriously thinking about a Mighty Mite maple neck. Mighty Mite necks are okay if you are on a budget. My favourite necks are from WD Music. An unfinished neck costs £120 and is well worth the extra in my view, given the total cost of the build and the fact that the feel of the neck makes or breaks a guitar. Thanks for your advice. I’ll check these necks out. Hi Dave. I’m about to start my first guitar build, and I’ve opted for a Cabronita – inspired by your project. Spec’s the same as yours and I wondered whether you’d be able to do a drop for me? If so could you give me a quote. Also, I’m going for TV Jones Classics and wondered whether I’d need mounting rings? As you can see I’m starting from a point of pure ignorance! Hi Mike. Sorry for the delay replying, but the comment went in to spam so I didn’t see it. Unfortunately I don’t understand your question – “do a drop” is that a typo? If you get the no-ears mount, you don’t need rings. I think all TV Jones are no-ears now though.